Gas-fired, forced-hot-air furnaces have a heat-producing system and a heated air distribution system. The heat-producing system includes the manifold and controls, burners, the heat exchanger, and the venting system. The heated air distribution system consists of the blower that moves the air throughout the ductwork and the ductwork assembly. The upflow furnace stands vertically and needs headroom. The furnace takes in cool air from the rear, bottom, or sides near the bottom. It discharges hot air out the top. The downflow furnace, sometimes referred to as a counter-flow furnace, looks like the upflow furnace. The air intake is at the top, and the discharge is at the bottom. spaces, in attics, or suspended from floor joists in basements. In these installations it takes no floor space. The air intake is at one end; the discharge is at the other. A multipositional furnace can be installed in any position. 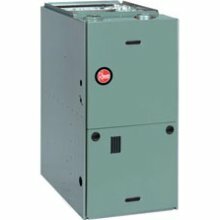 This adds versatility to the furnace, especially for the installation contractor. Multipositional furnaces can be upflow, downflow, horizontal right, or horizontal left air discharge. Many times, these furnaces come from the factory configured with very little modification in the field. Natural gas is composed of 90% to 95% methane and other hydrocarbons almost all of which are combustible, which makes this gas efficient and clean burning. Natural gas weighs 60% as much as dry air. Therefore, natural gas rises when discharged into the air. The characteristics of natural gas will vary somewhat from one location to another. When burned with air, 1 cubic foot of natural gas will produce about 1050 Btu of heat energy. Natural gas by itself has neither odor nor color and is not poisonous. SAFETY PRECAUTION: But it is dangerous because it can displace oxygen in the air, causing suffocation, and when it accumulates, it can explode. Sulfur compounds, called odorants, which have a garlic smell, are added to the gas to make leak detection easier. No odor is left, however, when the gas has been burned. Liquefied petroleum (LP) is liquefied propane, butane, or a combination of propane and butane. When in the vapor state these gases may be burned as a mixture of one or both of these gases with air. The gas is liquefied by keeping it under pressure until ready to be used. When burned, 1 cubic foot of propane produces 2500 Btu of heat. However, it requires 24 cubic feet of air to support this combustion. Propane gas is 1½ times heavier than air, so it sinks when released in air. SAFETY PRECAUTION: This is dangerous because it will replace oxygen and cause suffocation; it will also collect in low places to make pockets of highly explosive gas. SAFETY PRECAUTION: LP gas alone must not be used in a furnace that is set up for natural gas because the orifice will be too large. This results in over firing and soot buildup. 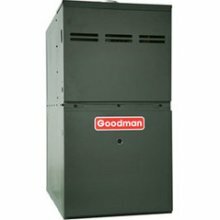 Furnace efficiency ratings are determined by the amount of heat that is transferred to the heated medium.